Dear reader, you may notice that this isn't a full review. Unfortunately, we were plagued with a bit of bad luck and the shipments with our review units were unavoidably delayed. Even though it's quite the coincidence, we trust that this was just a fluke. We obviously didn't feel comfortable posting full reviews with less than a day of use, so we're going to begin with first impressions for each watch, then follow with full reviews next week. In the meantime, feel free to ask questions in the comments and we'll do our best to answer as many as we can. Before drilling into any of the specific elements of this watch, I think it's worth emphasizing one thing about it: The word 'Sport' was definitely a driving force behind some of the decisions and tradeoffs that went into designing the final product. Almost everything about this watch seems to cater to a single idealized vision of leaving your phone behind and relying entirely on a device strapped to your wrist. You're ready to go out for a run and you're tired of having a phone flopping around loosely in your pocket. Do you want to track your run? The Sport has GPS for location tracking. Getting thirsty as you pass by a convenience store? Use Android Pay to buy a drink. Somebody needs to reach you? No worries, you've already enabled NumberSync and the call rings on both your phone and the watch, and there's a built-in speaker so you can carry on a conversation anywhere – as long as you don't need privacy. This is clearly what LG was picturing, and it's not hard to see why. I want all of these extra features, and I think most gadget lovers will agree. This thing is loaded with just about every spec and feature we've seen to date (not counting that Samsung Gear watch with the camera). However, packing so much into a watch will inevitably lead to some tradeoffs, and that leads into the first subject. The elephant in the room with the Sport model is that it's really, really big. At 1.38 inches, the screen is far from the largest among Android Wear watches, but it stands at a staggering 14.2mm thickness, practically towering above any other watch in the family. 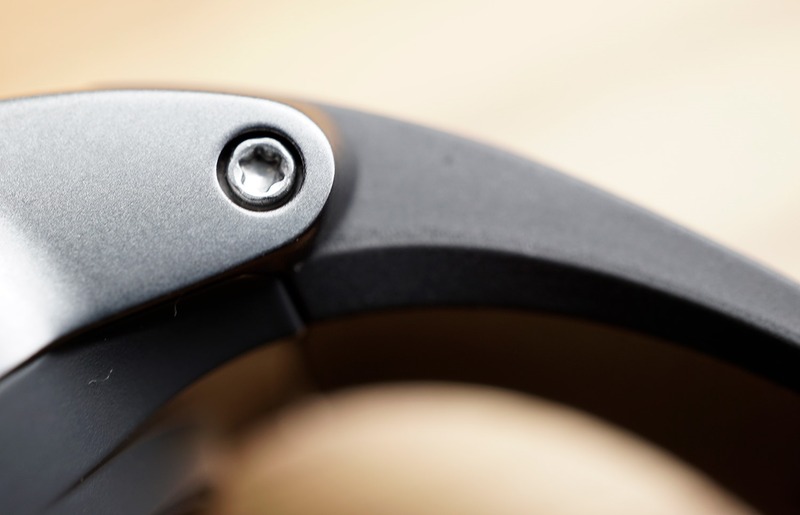 Aggressively tapered angles at both the lug mounts and the inside base of the watch do their part to lessen the visual impact of its size, but there's no escaping that this is not a watch you can wear subtly. Left: Asus Zenwatch 2. Middle: Huawei Watch. 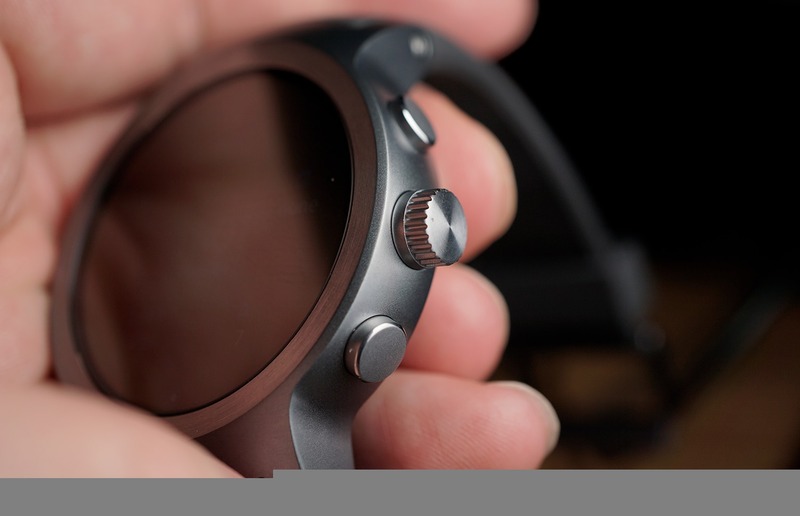 Right: LG Watch Sport. Rather than try to explain it, the picture above demonstrates it perfectly. On the left is the Asus Zenwatch 2. I've never heard any serious complaints about it being too thick, but it does have a notoriously large footprint and doesn't fit well on small arms. In the middle is the Huawei Watch, which is noticeably thicker, enough that it can stand out. However, the footprint is small. 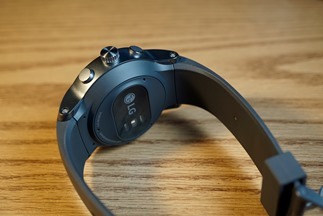 And finally the LG Watch Sport. It's 20% thicker. But this is where we have to come back to the point that this is intended to be a sports watch, a category known for being oversized, slightly overpriced, and generally loaded with features. 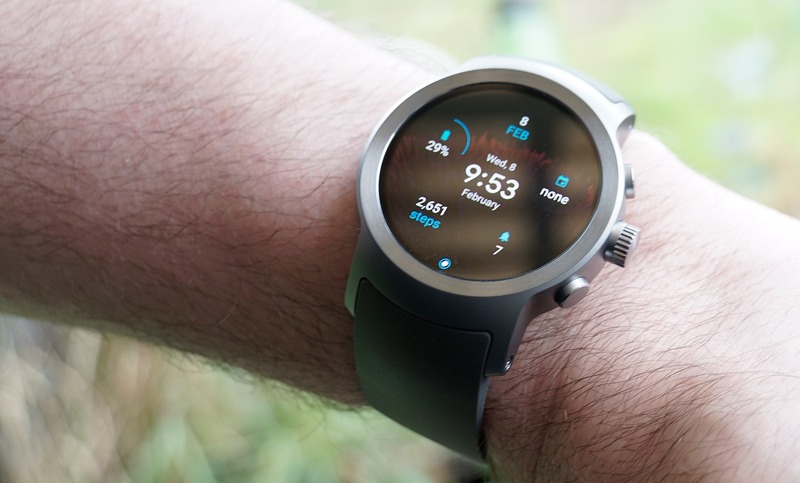 Compare the LG Watch Sport to most dedicated GPS running/cycling trackers, and it's actually on the small-ish side. The front frame is stainless steel while the backing is plastic and the straps are TPU (Thermoplastic Polyurethane). Two colors are going to be available: titanium and dark blue (only available direct from Google). I wasn't fond of the frame design used in earlier LG watches. The corners were too soft and rounded for my taste. The Sport steps slightly away from that look and includes a few clearly defined lines and edges. 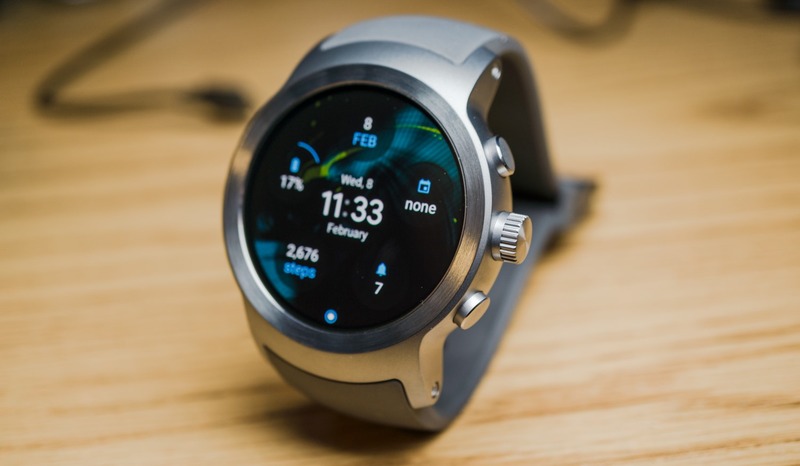 It's certainly not what I would call fashionable, but if we set other sport watches as a bar, the LG Watch Sport crosses it without much competition. As for the straps, I have to admit that I don't like that they're made out of TPU. I find the material doesn't breathe well, gets uncomfortable to wear, and it looks cheap. This is a reason I'm generally not a fan of any sport watches. Unfortunately, the bands aren't interchangeable because they contain several antennas. Perhaps the most annoying part is that the straps stick out in a fairly rigid angle, which obviously made pictures a bit challenging. I didn't find the angle of the straps uncomfortable, and they are plenty flexible, but it feels awkward. Like many others, I chided Apple for using a crown on its smartwatch. However, my issue wasn't so much that it was there, but that it was basically required. Not only that, but the presentations made it look like users would have to constantly switch between interacting with the screen and using the crown. It looked tedious. With Android Wear 2.0, there is now support for a digital crown. It's not specifically required, but it allows for scrolling in most windows that extend beyond the bottom of the screen like the app list, notifications, and emails. This keeps your fingers out of the way while you read. App developers will also be able to take advantage of it when an update to the SDK is released. Google Maps is the only app I've noticed that makes special use of the crown, allowing it to be used for zooming. So how is it? In short, it's really nice. The action of the crown is very smooth, not clicked, and there's zero detectable lag between the crown and scrolling through things like the app list. It's much better than I expected it to be. There are also two buttons flanking the crown. By default, the top one opens Google Fit and the bottom one leads to Android Pay, but they can both be set to open any app. Unfortunately, they're not very useful since they only work when you're looking at the watch face. I'm pretty sure apps will also be able to intercept these buttons. For example, the in-call interface allows you to adjust volume by pressing these buttons. They don't look bad, so I won't knock them, but I don't think they're as useful as they were intended to be. 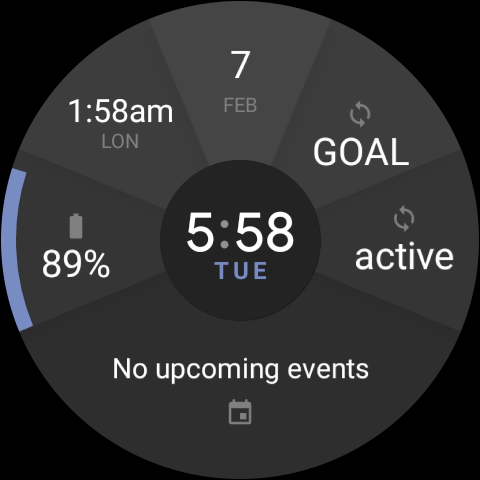 As I write this article, I've only had the watch out of the box for slightly more than twelve hours, and much of that time has been spent with setup, app installs, and trying out new features. It should go without saying that there's no way I can have a fair assessment of battery life in that time. The full review will dig into the subject of battery life after the watch is allowed to settle into a pattern of regular use. With that said, and with full acknowledgement that this isn't entirely fair to say yet, I still don't feel like the battery life is very promising. Perhaps it's because I've got classic battery drainers like always-on screen, LTE, and Wi-Fi enabled, but I'm not confident the Sport could live up to my arbitrary expectation that a watch should last a bare minimum of 24 hours on a single charge. I look forward to trying it with and without always-on mode, and even killing the cellular connection when it's not needed. It hasn't exactly been widespread, but quite a few people have already experienced Android Wear 2.0 through the developer previews. Aside from some early missteps, it's a marked improvement over earlier versions. I don't want to dive into the OS any more than I already have until the review, but there are a couple of general comments that deserve to be made. First, these watches are smoother than ever. The experience of using Android Wear 2.0 on the LG Watch Sport is in a category completely separate from all Wear devices I've touched before. I've seen no dropped frames, no glitches, and no touch lag. It reminds me of switching from a Desire HD to the Nexus 4, or every time I go from using a certain company's notoriously laggy phone to a Pixel. Even if nothing else was improved, this makes Wear better to use. Second, the watchfaces look great while being fairly understated. Most of the Wear partners have turned out some really good looking watchfaces in the past, but they tend to be exaggerated and elaborate. The versions included with this watch are fairly elegant, and all of them support complications, those little widget-like segments that can be filled by other apps installed on the watch. I want to dig into these more deeply with the review, but for now I just want to say that I'm happy with the work that went into these. 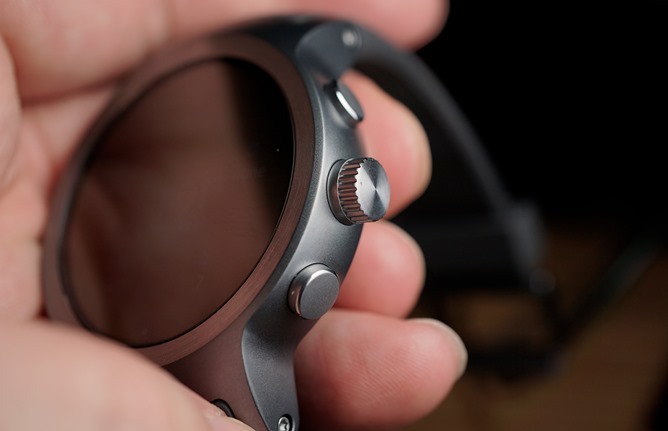 There's really a lot to the LG Watch Sport. It's safe to say it's basically the new king of Wear, at least in terms of how much is packed into its body (and spilling out into the straps). I still haven't had time to try out a large amount of what's available, including Android Pay, making calls, or using the GPS. There are also additions to Google Fit, the switch to Google assistant, and many other things. This is why I'm looking forward to writing a full review soon. Even though I've got much left to explore, I'm more than comfortable saying that the LG Watch Sport isn't for everybody. It's too thick to be worn by many people in normal day-to-day use, especially for most women. On the other hand, it's really not that big compared to even remotely comparable sports watches. You won't want to wear this out to a fancy dinner, but it would be totally acceptable or even normal on a run or at the gym. But at $349 (or so), it might also be a bit too pricey for a watch you're only planning to wear when you hit the trails or stop at the gym. It's a great watch, but sadly, I think size may become a deal breaker for many potential buyers. When people are already asking for smaller watches, it seems like a sports watch may have trouble gaining traction. Anyway, I will have much more to say about this next week. Again, leave questions in the comment section and I'll try to keep up with them over the next few days.